Game 4 was an exciting see-saw battle between the two teams. The Phillies struck first; in the top of the first they collected three hits and two runs off Derek Lowe, who started on three days' rest. In the bottom of the inning, James Loney hit a ball off the center field wall to score Rafael Furcal and cut the lead to 2–1. Starter Joe Blanton began strong, but in the fifth inning gave up two runs and forced Charlie Manuel to go to his bullpen. In the sixth, the Dodgers' bullpen faltered first, when Clayton Kershaw gave up a walk and a hit, and Chan Ho Park threw a wild pitch to tie the game. In the bottom of the sixth, Casey Blake homered to left, and with two on, a throwing error by Ryan Howard allowed Juan Pierre to score. The inning ended when Chase Utley made a diving catch and stumbled to second base for the double play. Things looked great for the Dodgers until Cory Wade relieved in the eighth and Shane Victorino hit a two-run home run that landed in the LA bullpen to tie the score. Jonathan Broxton came in after Carlos Ruiz singled off of Wade and promptly gave up another two-run homer to pinch-hitter Matt Stairs, the veteran's first career postseason homer. Brad Lidge then came in and pitched his first save of 2008 that consisted of more than three outs, his 49th consecutive save. ↑ "2008 NLCS Game 1 - Los Angeles Dodgers vs. Philadelphia Phillies". Retrosheet. Retrieved September 13, 2009. ↑ "2008 NLCS Game 2 - Los Angeles Dodgers vs. Philadelphia Phillies". Retrosheet. Retrieved September 13, 2009. 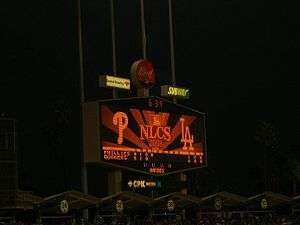 ↑ "2008 NLCS Game 3 - Philadelphia Phillies vs. Los Angeles Dodgers". Retrosheet. Retrieved September 13, 2009. ↑ "2008 NLCS Game 4 - Philadelphia Phillies vs. Los Angeles Dodgers". Retrosheet. Retrieved September 13, 2009. ↑ "2008 NLCS Game 5 - Philadelphia Phillies vs. Los Angeles Dodgers". Retrosheet. Retrieved September 13, 2009. ↑ "Phils' Manuel's mother passes away". MLB.com. Retrieved February 24, 2009.